Combat climaxed in April 1975 when the Lon Nol regime was overthrown by Pol Pot, leader of the Khmer Rouge forces. The four years of nightmarish Khmer Rouge rule led to the state-sponsored extermination of citizens by its own government. Between 1 million and 2 million people were massacred on the “killing fields” of Cambodia or worked to death through forced labor. Pol Pot’s radical vision of transforming the country into a Marxist agrarian society led to the virtual extermination of the country’s professional and technical classes. Free elections in May 1993 saw the defeat of Heng Samrin’s successor, Hun Sen, who refused to accept the outcome of the vote. In early July, Hun Sen took advantage of the country’s political turmoil to depose Prince Norodom Ranariddh, the country’s only popularly elected leader. Hun Sen later launched a brutal purge, executing more than 40 political opponents. Shortly after the July coup, the Khmer Rouge organized a show trial of their notorious leader, Pol Pot, who had not been seen by the West in more than two decades. He was sentenced to house arrest for his crimes against humanity. He died on April 15, 1998. In the July 1998 election, Hun Sen defeated opposition leaders Sam Rainsy and Prince Ranariddh, but the opposition parties accused him of voter fraud. Cambodia was able to regain its UN seat, lost nearly a year earlier as a result of Hun Sen’s coup. Elections in July 2003 resulted in a stalemate—none of the parties won the two-thirds majority required to govern alone. Almost a year later, in June 2004, Ranariddh and Hun Sen agreed in June 2004 to form a coalition, with Hun Sen remaining as prime minister. 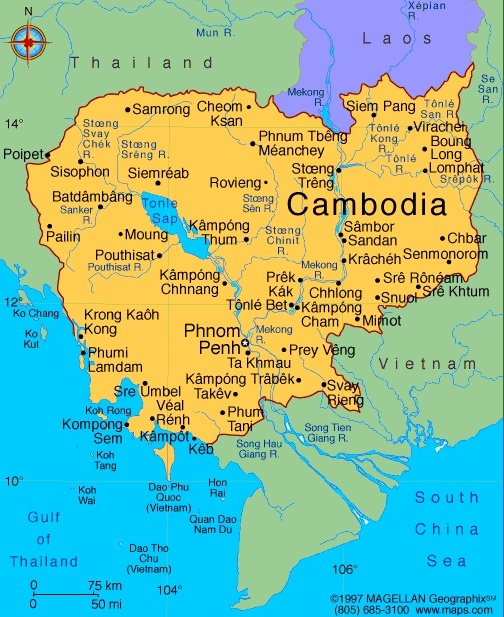 In August, Cambodia’s parliament ratified the country’s entry into the World Trade Organization. King Norodom Sihanouk announced in Oct. 2004 that he had abdicated and selected his son, Prince Norodom Sihamoni, to succeed him. Prince Sihamoni, a ballet dancer and choreographer, lived in France and had kept a distance from Cambodian politics. Unlike his father, Sihamoni refrained from intervening in the country’s politics, opting to reign as a spiritual and ceremonial figurehead. King Norodom Sihanouk, who abdicated in 2004, died in October 2012 in Beijing at age 89. The country observed a week of mourning following his death. Observers questioned if his successor, Sihamoni, would begin to immerse himself in the country’s politics or continue to keep a distance from such matters. Tension between the ruling Cambodian People's Party (CPP) and opposition groups, particularly the Cambodian National Rescue party (CNRP), have waxed and waned in recent years. With upcoming national elections looming this summer - July 29 - potential for conflict is rising, with frequent security warnings for foreigners in the country being published by the US embassy and others .